Indian weddings are popular around the world for being grand. 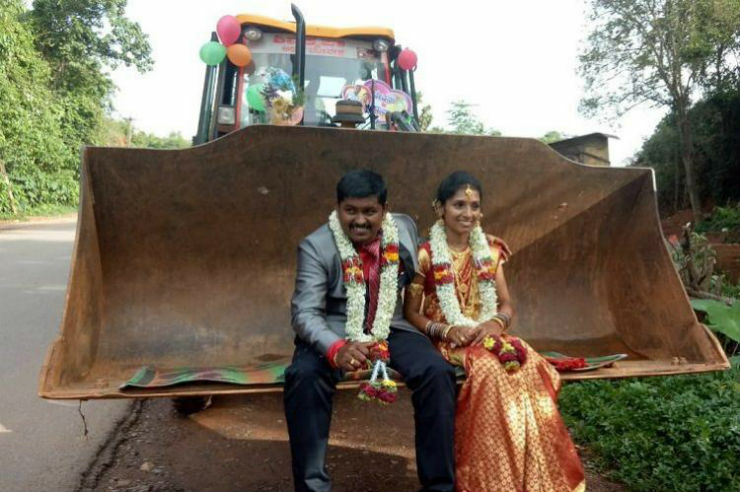 However, this newly married couple from Karnataka wanted to do something unique after tying the knot and instead of choosing a regular mode of transportation after the wedding, they used a JCB bulldozer as their wedding car! Chethan Kallakatta, who has been a JCB crane operator for over a decade, got married recently. 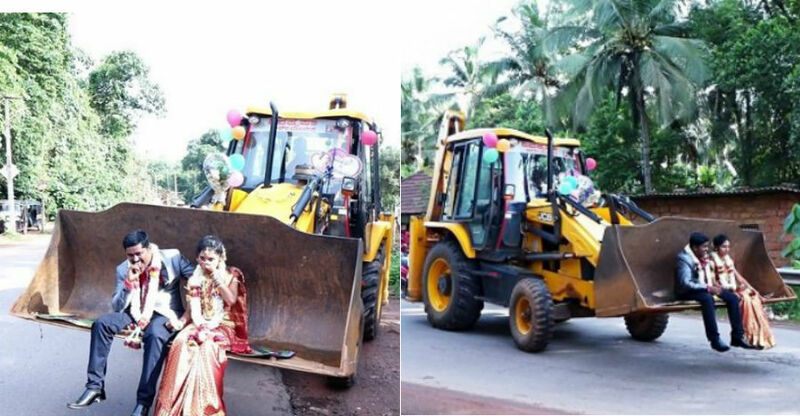 To make his marriage unique and to show the passion towards his work, the crane operator and his friends decided to use a JCB crane in the marriage. The couple decided to use the JCB crane as their first ride after the marriage and both of them were seen sitting on the JCB backhoe loader. The video also shows the crane decorated with flowers and balloons, just like a wedding car. The couple can be seen sitting in the loader while it passes through the streets. Even though the idea was conceptualised by the husband and his friends, Chethan has revealed that his 22-year old wife was not as excited as him with the idea. She was scared initially to sit in the loader but Chethan ensured that there is nothing to worry about and they should go ahead with the idea. The couple sat in the loader throughout their way home from the wedding venue. It is not known how long they travelled this way but it did involve driving on public roads. The procession was seen driving at a slower speed in the video but we cannot confirm if the speed remained the same throughout. Even though it may seem like a fun idea, the couple was sitting in the loader without any safety harness and any sudden acceleration or braking could have caused a disaster. While it is a unique way of celebrating the occasion, one should always take care of safety while doing such stunts on the public roads.